Many Tamil activists see the ousted Ranil Wickremesinghe as less brutal than Mahinda Rajapaksa. In November 2014, Maithripala Sirisena, who was then a cabinet minister and member of the Sri Lanka Freedom Party, broke ranks with his leader, President Mahinda Rajapaksa, and agreed to be the common presidential candidate of the Opposition, led by the United National Party. Sirisena won the election in what was then hailed as a “democratic revolution”. He undid that “revolution” on October 26 this year when he sacked Ranil Wickremesinghe as prime minister and appointed Rajapaksa in his place. He did so ignoring the constitutional amendment he had helped pass after coming to power in 2015, which had done away with the president’s power to remove the prime minister. He thus triggered what is being called Sri Lanka’s first unconstitutional transfer of power – a coup. First, Sirisena won the 2015 presidential election on the strength of the votes of the minorities – Tamils, Muslims and Malayaha (up country) Tamils. He lost the Sinhala vote to Rajapaksa. It was clear from the very beginning that Sirisena suffered from a sense of inferiority at the fact that despite being head of state, he was not recognised as leader of the Sinhala Buddhists, the country’s majority community. Second, Rajapaksa was growing in popularity and, according to analysts, stood a very good chance of emerging as the leader of the single largest party in the next general elections. Sirisena wanted to strike a deal with Rajapaksa so that he could be his party’s presidential candidate in January 2020 – and hence the offer of prime ministership to Rajapaksa. Third, Sirisena did not want to go down in history as the leader who split the Sri Lanka Freedom Party, to which he has dedicated more than 40 years of public life. After he won the presidential election in 2015, he became the leader of the party while Rajapaksa went on to form his own political party, the Sri Lanka Podujana Peramuna. 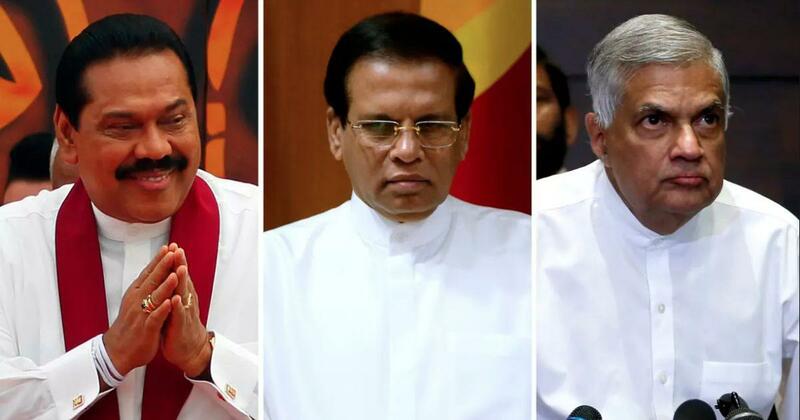 There was a lot of hype around candidate Sirisena within the Tamil community in 2015 – similar to the hype over President Chandrika Bandaranaike Kumaratunga in 1994 and Prime Minister Ranil Wickremesinghe in 2001, all of which was short-lived. But some within the community warned that a close look at Sirisena’s policies showed that these were only cosmetic changes. Wickremesinghe, who heads the United National Party, was appointed prime minister soon after Sirisena’s election victory in January 2015. He solidified this position with a parliamentary election victory in August 2015. One of Wickremesinghe’s early priorities was to come up with a “transitional justice” programme to appease the United Nations Human Rights Council. The Council had passed a resolution every year since 2012 “promoting reconciliation, accountability and human rights” in Sri Lanka and calling for an independent inquiry into wartime atrocities in the closing stages of the country’s 26-year-long civil war with the Liberation Tigers of Tamil Eelam that ended in 2009. Wickremesinghe had claimed during the elections that it was Rajapakasa’s mismanagement of foreign policy, particularly his decision to side with China, that had led to the resolutions. The government led by Sirisena and Wickremesinghe, hence, took the extraordinary step of co-sponsoring a resolution at the UN Human Rights Council in 2015 that, among other things, promised to set up a hybrid court to investigate war crimes. This was part of their plan to unhook Sri Lanka from the Council. The hybrid court is yet to be set up. Parliament passed legislation to create an Office for Missing Persons in 2016 but it took the Sirisena-Wickremesinghe government another two years to appoint its commissioners. This year, an Office for Reparations was formed but it has been severely criticised for lacking independence. Some land occupied by security forces during the armed conflict has been released. Some political prisoners have also been released but the government has shown a lack of political will to coherently address this matter. The Prevention of Terrorism Act is to be repealed and replaced by a Counter Terrorism Act, which leaves out some of the most draconian elements of the current legislation but is still fundamentally incompatible with global human rights standards. For more than 600 days now, the mothers of those who disappeared in the final stages of the war have been out on the streets in the country’s north and east, but have received no concrete response from the government. (Wickremesinghe had said in an interview in 2016 that the disappeared were probably dead). Tamils have been protesting in Keppapilavu, Mullikulum, Valikamam and many other parts of the north and east. Sirisena and Wickremesinghe also did nothing to reform the security establishment. Surveillance continues and attacks on activists working with the families of the disappeared are on the rise. Just days into the new regime, threats from the Sri Lankan Army intelligence, Criminal Investigation Department and Terrorism Investigation Department towards activists have escalated at an alarming speed. Transitional justice was, hence, just smart foreign policy for the Sirisena-Wickremesinghe duo. Wickremesinghe knew he would not be implementing the 2015 UN resolution co-sponsored by his government but that he needed it to win over the West and show allegiance to the liberal international order. Colombo civil society and the international community have criticised, mildly, progress made under the Sirisena-Wickremesinghe government as “slow progress”. We were advised by the diplomatic corps, colleagues in Colombo civil society and the Tamil National Alliance, the largest Tamil political party in Parliament, which is cosy with Wickremesinghe, not to “rock the boat” by asking for “too much” reform. But the Tamil community knows that without structural reforms, some of the changes – including the small space for protest and dissent that emerged with the change of regime in 2015 – will be immediately reversed by a successive regime that comes to power on the strength of a Sinhala Buddhist nationalist backlash. This is exactly what we fear is going to happen if or when Rajapaksa succeeds in proving his majority in Parliament and is confirmed as prime minister, or if and when he wins the next general elections. Sirisena has agreed to summon Parliament on Wednesday in response to demands for a floor test. On Friday, the Tamil National Alliance with 15 MPs announced its support to Wickremesinghe. They cloaked it as a vote against Rajapaksa (and not necessarily a vote for Wickremesinghe). Their vote will be very important in deciding who will be prime minister. The Tamil Civil Society Forum asked the party to use this opportunity to demand certain things in return for their support. But the party has made no demands and received none in return. Many activists in Colombo and abroad are critical of Tamils who demand that the Tamil National Alliance extend only conditional support to Wickremesinghe. They say that Wickremesinghe is necessary for better rule of law. What they mean is that Wickremesinghe will be less brutal in his tactics than Rajapaksa. The Tamils are thus condemned to choose between two security regimes. Every time we can make a difference, we are asked to support the actor that can guarantee, albeit marginally, our existence. The reductionist reading of the Tamil struggle for self-determination, justice and accountability to a mere existentialist struggle will solidify Sinhala Buddhist ethnocracy in Sri Lanka, slowly but surely. Kumaravadivel Guruparan is Senior Lecturer in Law at the University of Jaffna, Spokesperson for the Tamil Civil Society Forum, and Executive Director of the Jaffna-based Adayaalam Centre for Policy Research. Posted November 8th, 2018 . Tamil Diaspora is behind and supportive of TGTE as it’s demand for an International independent war crimes and genocide investigation and only a separate Tamil Eelam will bring peace, stability, protection, end of abuses, oppression and war crimes to Tamils. TNA has lost it’s credibility as a party of Tamils under Sampanthan and no Tamil with self-esteem will recognize Sumanthiran as a leader who failed to address Tamils’ grievances, not exposed Sinhala Buddhist Governments genocidal activities and failed to call for an international independent genocide investigation. History will tell us that these guys are not leaders but as traitors. After Indra Gandhi, Indian federation has been a failure on Democratic, Moral, Ethical values, fair international policies as Malayalee mafias and corrupt leaders infiltrated Indian politics for their personal benefits at the expense of Indian democracy and no more democracy in the so called land of Gandhi. Tamil Diaspora is large, strong, vibrant, engage in politics in their native country and also closely watching, monitoring and collecting ground situation and information in not only in Tamil Eelam but also in Tamil Nadu. Tamils in North America call themselves as “Dravidian Tamils” and not as ” Indians” as India was created by the British colonial rulers and it never existed prior to Western colonialism. How long the local leaders in India and Sri Lanka who are unfit, failed, incompetent, corrupt, chauvinistic to mislead, corrupt, fool, lie voters and their citizens? Unhappy US voters preferred and elected Donald Trump, a non politician as President in the USA. Brazilian voters voted for an extreme right wing leader to power. History and Global Landscape is changing all the time. Many former powerful Kingdoms, Rulers, Landscape and Governments are no longer existing and disappeared. Tamils struggle for Equality, Justice, Freedom, Independence, Rule of law and dignity is genuine, legitimate and it’s from the bottom of their heart!